HSC 9 is based on the same Microsoft .NET environment as HSC 8. 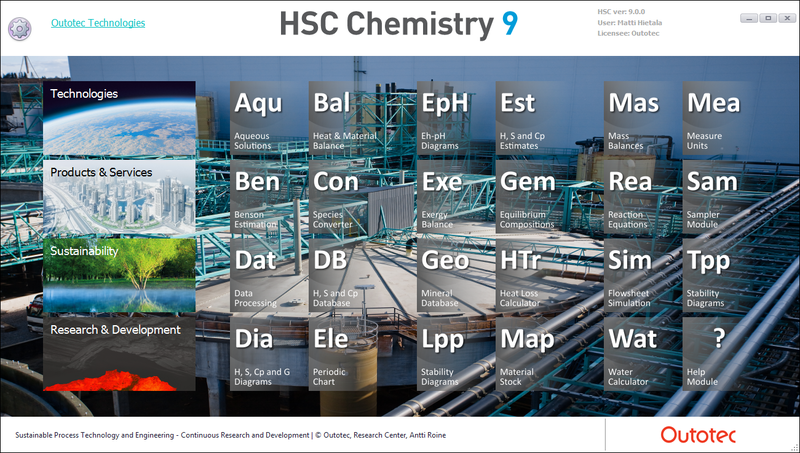 However, HSC 9 contains many new features, new modules, and several improvements to the old modules. These new features will be released gradually within the HSC 9 maintenance releases that become available with an HSC 9 subscription. The new HSC 9 license also contains a one-year subscription, which means that the customer will also receive all the minor and major HSC updates that are published within one year of the purchase. A valid subscription gives you the most up-to-date version of the HSC Chemistry modules. HSC license is perpetual, but valid subscription is needed to get the new updates. HSC 9 – Basic License is good for personal laptops and workstations and other local Machines. HSC 9 - Floating License is good for personal laptops and workstations and other local machines, if only very few out of many users are using HSC simultaneously. Installation is made on the local devices. HSC 9 - Server License gives the flexibility of using HSC via remote connection by several end users. HSC updates are also easy to carry out, because installations are carried out on one server. However, a lot of calculation capacity and fast network access are needed if several end users are using HSC on the same server. The Server License will be released in Q1/2016. HSC 9 - Virtual Device License gives the flexibility of running HSC on a virtual device. This, for example, makes it possible to run HSC on an Apple machine if Boot Camp multi boot utility is not available. The Virtual Device License will be released in Q1/2016.